With a new brand identity, Chicago-based architectural firm Goettsch Partners is all glued with Al Maryah Island – one of the biggest construction sites in Abu Dhabi. Assigned as a new investment zone of the city, Al Maryah is planned as a thriving, high-density residential, retail, leisure, hotel and commercial district. A substantial part of Plan Abu Dhabi 2030: Urban Structure Framework Plan, the lip shaped Island will soon kiss a major urban and architectural revolution. At Al Maryah Island, once known as Sowwah Island, Goettsch Partners has designed Sowwah Square – the commercial core of the Island – along with Sowwah Square Pedestrian Link Bridge and Walkway. The bond between Al Myrah and Goettsch Partners is reinforced again as the firm launched its new design for commercial development for Al Hilal Bank. Sowwah Square is easy to spot with its weird angles and chamfers. It is a 450,000 sq m office, retail and hotel development scheme, which includes Abu Dhabi Securities Exchange Building surrounded by four office towers. The Sowwah Square Bridge and Walkway resembles a long kaleidoscopic tunnel with its numerous structural steel ribs and triangles. 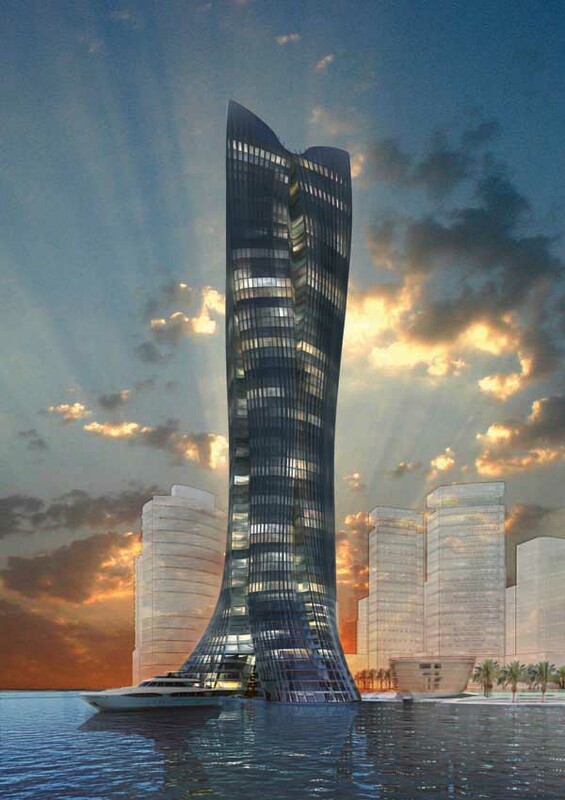 The 24 storey proposed commercial building for Ali Hilal Bank totals 87,570 square meters overall, including office, retail and parking spaces. The tower has un-aligned play of masses as it escalates, breaking its canny linearity. Three cubical masses sit atop the podium, stacked with slight shifts and accentuated by creating voids. The podium contains a retail banking facility as well as three-story transparent lobby with pedestrian arcades. The façade is fabricated by aluminum-and-glass curtain wall system emphasizing the verticality of the masses. The Ali Hilal Bank tower looks like unevenly stacked shipping containers with barcode aesthetics. The completion of stacked tower is scheduled towards the end of 2013. September 11, 2012 in Articles.